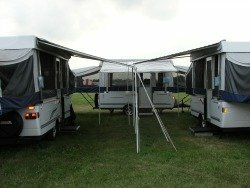 Tent campers or pop up tent trailers are tents that pop up or unfold out of a trailer that is towed behind another vehicle. They are erected with tent poles like a regular tent. These type of pop up trailers are not as luxurious as the pop up camping trailers. They do not include the same amenities, such as a compact built in kitchen and a dining table and seating included with and inside the trailer. Instead the table and chairs are extras that you must bring along. They are more like regular tents accept the bed section is attached to the trailer. This is nice because it will still get you up off the ground without having to cart cots or blow up air mattresses. Some seem to have a tool box style kitchen, with stove and sink, attached to the trailer. 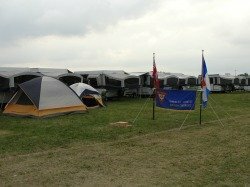 While they don’t have that compact pop up comfort like the pop up camping trailers, they still are a step up from regular tents, depending on the brand and style. I had never seen these type of campers before I came across videos of them while looking for camping trailers. I thought they were the same as the other pop up trailers, but I see there is a big difference.